Are you keeping your cat happy? Cats require love just like dogs do, as well as some attention to their own unique set of needs. Contrary to a common held misconception, cats need your help to reach their happiness potential. A little attention goes a long way with your seemingly independent and aloof feline housemate. So where do you start? Keep reading to learn how you can keep your cat happy. 1. Keep your cat happy by taking him to the vet. A cat’s overall wellness is just as important as a dog’s. Routine well visits must take place. You might be thinking, “I know, I know.” However, the AVMA statistics support the fact that more dogs are being taken to the vet than cats. The statistics state that “Among cat owners, 44.9 percent did not take their cat or cats to a veterinarian during 2011, up from 36.3 percent in 2006. Among dog owners, 18.7 percent did not take their dog or dogs to a veterinarian during 2011, up from 17.3 percent in 2006. The statistics don’t lie. There are many possible reasons why cats receive less attention in terms of veterinary care, but one specific reason can be potentially fatal. Cats mask illness and injury like they’re getting paid to do so! That is perplexing, but has a very reasonable explanation. Cats are still responding to instincts that have been passed down for so many generations. It is an internal mechanism to keep them safe from predators. This makes it hard to those caring for cats, we get that. However, being keen about slight or subtle changes in your cat can keep him healthier and thus happier. If something doesn’t seem right with your cat, chances are you are onto something. Even if you miss the subtle signs your cat is trying to hide, keeping up with routine well visits can help catch any possible signs or symptoms that your cat may be hiding from you. 2. Keep your cat happy by providing him to act upon their instincts. Cats are still born to hunt and explore. Unlike dogs however, cats are cooped up indoors all day every day. Due to this fact, providing an environment in the home that will meet the stimulation needs of your cat is imperative. First, can enrich your cat’s environment and keep him happy is by allowing your cat access to toys that he’s excited about. This can be tricky because some toys just won’t tickle your cat’s fancy. The right toys will help your cat to act out on his predatory instinct. You can help him feel like he’s “hunting” his prey. Now more than ever, there are so many high tech toys that will meet this very specific need. However, the tried and true mice, balls, laser points and feather wands just may do the trick, too. My point is that there are SO many options. Stay diligent in finding the right toys. Mix things ups to keep it interesting or your cat will grow bored. Another way you can enrich your cat’s environment and keep him happy is by allowing his access beyond the four walls in which he lives. There are many window seat options for your cat to get nestled in and watch the world around him. In warmer weather, keep the window open so he can catch the smells of the great outdoors through the screen. He’ll enjoy watching the birds and the squirrels from his perch. If you are lucky enough to have a screened in porch, your cat will love that even more. Some people even take their cats out for walks on a leash. You can attempt to walk your cat, too. However, it will take some getting used to by your cat. In fact, some cats never take to being walked on a leash. Similarly, you can enrich your cat’s environment and keep him happy by getting him a scratching post. Many people associate scratching with destructive behavior. This is the frame of mind that causes many cats to be punished in one way or another, end up shelters, let out into the outdoors on their own, declawed or even euthanized. A scratching post allows your cat to do what he was born to do! Cats scratch to stretch! When they stretch their whole bodies, happy hormones are released. The release of these hormones are essential to overall good health. Cats also scratch for territorial reasons. The scent from their paws is left behind to tell other cats to “back off”. The marks they leave also convey this same message. Grooming is another reason that cats scratch. When cats scratch the outer layer of their nail comes off. It’s supposed to! 3. Keep your cat happy by making him easily identifiable. Even indoor cats can get lost. A scared cat is very resourceful and one of a cat’s resources is the fight or flight instinct. Most cats will choose the flight option in bad weather, when strangers are in the home or any other slew of reasons when they are frightened. Now more than ever, it’s necessary to keep an identification tag on your cat’s collar at all times. The tag should show exactly how you can be reached in the event your cat is lost. Additionally, a bright collar will alert people right away that your cat is an indoor cat with a family and not a feral cat. Microchipping your cat is another way of helping others to identify your cat if he gets lost. 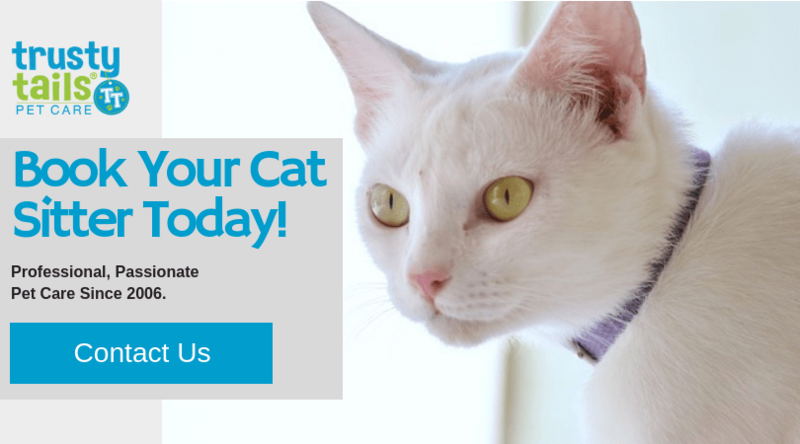 Microchipping is the second line of defense in case your cat’s collar comes off. Be sure that both are always up do date! 4. Keep your cat happy by keeping him well hydrated. Cats need a proper diet to live long, happy, healthy lives. That’s pretty standard for all animals and humans, but did you know that special consideration should be given to the amount of water your cat is drinking? It’s true! In addition to protein, fats, minerals and vitamins as part of their daily diet, cats need water. Fresh water and plenty of it is a staple of every cat’s diet. Cats are used to getting most of their water intake from the food they eat. Domesticated cats, of course, don’t often get this opportunity. Many cats only eat kibble and therefore are experiencing health issues due to dehydration because their naturally low inclination to drink water. Your cat’s water supply should be fluoride free and free of toxins. 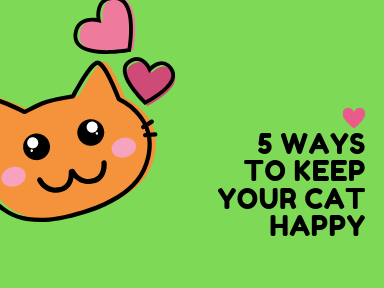 In conclusion, keeping your cat happy takes a little more work than most people think. There is a lot that most people still need to learn about cats and their unique needs. Keeping a cat happy is more than giving him a soft place to sleep and a bowl full of food. A cat has many instinctual needs that are often not met, thereby resulting in a very happy union with the human members of the family. It has been discovered that most behavioral and emotional disorders in cats can be rectified by strictly adjust then environment in which the cat lives. What Makes Your Cat Happy? Let us know in the comments below. Next Post: Is It Safe For My Dog To Eat Snow?